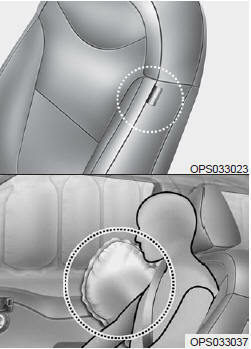 The side air bags are designed to deploy during certain side-impact collisions, depending on the crash severity, angle, speed and point of impact. The side and/or curtain air bags do not only deploy on the side of the impact but also on the opposite side. The side and/or curtain air bags on both sides of the vehicle will deploy if a rollover or possible rollover is detected. The side air bags are not designed to deploy in all side impact or rollover situations. The side air bag is supplemental to the driver's and the passenger's seat belt systems and is not a substitute for them. Therefore your seat belts must be worn at all times while the vehicle is in operation. To prevent unexpected deployment of the side air bag that may result in personal injury, avoid impact to the side impact sensor when the ignition switch is on. If seat or seat cover is damaged, have the vehicle checked and repaired by an authorized Kia dealer. Inform the dealer that your vehicle is equipped with side air bags and an occupant detection system.